There have been many cool designs over the years which have succeeded in making their mark on the modern world. Designers are constantly trying to push the boundaries with creations which inspire awe and wonderment. Some designs are inherently far more exciting and revolutionary than others to the point that they actually defy belief. Of course where a design is a visual masterpiece, it will help that the intended use is equally as cool. Here we take a look at 3 of the coolest designs which will most certainly have the coolest purpose. The Sea Orbiter is an ambitious project made up of the joint efforts and expertise of an architect, astronaut and oceanographer. This is a £50 million sea exploration vessel intended to provide a permanent home to researchers and scientists which will allow them to monitor the seas, 24 hours a day. A revolutionary and futuristic design, it could be seen as a manifestation of a dream by Jacques Rougerie who’s foundation is behind the project. He had a desire back in 1973 to create an underwater village. The vessel is striking and looks like a giant metallic sail. 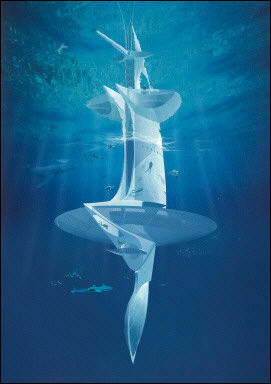 It will be 58 metres tall with 31 of those being below the surface. It will have pressurised living quarters which will allow divers to dive without constant depressurisation. In addition, there will be deep sea submarine launch area and solar panels with wind turbines above. Despite being permanently grounded we have to mention the Concorde. This was a joint partnership with Britain and France to produce the world’s first and only supersonics airliner. This design was a first for the airline industry in the sense that it utilised a delta wing structure. The aircraft whether in the ground or in the air looked like no other, although some initially criticised its awkward nose which they considered an ugly characteristic. However, the aircraft was graceful to look at whilst in the air often reminiscent of a diamond at 60,000 ft. This was an aircraft that not only looked cool but it had a credible purpose which enabled passengers to travel from London to New York in just over 3 hours which was less than half the time of the fastest conventional aircraft. This would often mean that a passenger could have breakfast in London and then another one when they reached JFK. It could be argued that Concorde was one of the greatest achievements of British and French design and engineering. There’s no disputing that the Smartphone market is becoming quite competitive of late but it was Apple’s iPhone that inspired and impressed millions of people worldwide. It’s sleek, innovation and design was and still is a thing of beauty. Steve Jobs was a passionate man with a vision and it certainly shows in the visual attributes of this amazing device. It is in fact the last phone that he had direct involvement with. The iPhone has an uncluttered screen with scratch proof glass. Not many people can deny that this is a good looking phone. It is a phone however and the good news is that it has some of the most amazing features possible in a device of this type. In fact with more apps available in iTunes than any other Smartphone market, it is hard to ignore. The new and improved touch screen enable the phone to be utilised as an iPod, camera, GPS, gaming system as a well as a regular phone for making calls. There is clearly more to it than just looks alone. Written by Sydney Michaelson, who loves to be inspired by great design. Why not continue to be inspired at Design55Online.co.uk?